Managing wildfire for resource objectives and ecological purposes refers to a strategic choice to use unplanned ignitions to achieve resource management objectives. Federal fire policies traditionally restricted use to Federal wilderness areas, national parks, or other remote areas under specific conditions or circumstances. These restrictions were intended to reduce risk and avoid potentially negative impacts or consequences to lands of other ownership. Guidance issued in 2009 regarding implementation of Federal fire policy ensures consistency among agencies and has led to expanded application of this method to manage wildland fuels. In contrast, most state and local jurisdictions are statutorily constrained to provide full wildfire suppression due to values at risk, human-caused fires, and protection of private lands. Like prescribed fire, allowing wildfires to burn for the purposes of ecosystem restoration or hazard reduction has inherent risk. These risks must be balanced with the potential benefits on an individual incident basis, which requires both pre-incident planning at the landscape scale and sophisticated incident management. 2.a: Wildfire for Resource Benefits (WFRB) in forest landscapes. | 2.b: WFRB in non-forested landscapes. Opportunities for managing wildfire for resource objectives were identified by first looking at those areas where prescribed fire was deemed suitable. Counties where managing wildfire for multiple benefits in forested landscapes seems plausible (Option 2.a, figure 3.4) are identified separately from those counties dominated by non-forest vegetation where this tactic might also be applied (Option 2.b, figure 3.4). Both Options 2.a and 2.b are associated with rural areas with few roads, low numbers of ignitions (mostly natural), moderate flame intensities, and large contiguous blocks of natural vegetation. The forested areas have a high percentage of Federal ownership (primarily USFS, Bureau of Land Management (BLM), or NPS) and a mix of FRGs I, II, and IV. Non-forested areas include counties with low Federal ownership and FRGs II and IV. In some areas, management constraints will limit opportunities for managing wildfire. For example, sage grouse conservation efforts focused on preserving critical habits from wildfire is a significant constraint in many areas and warrants special consideration. 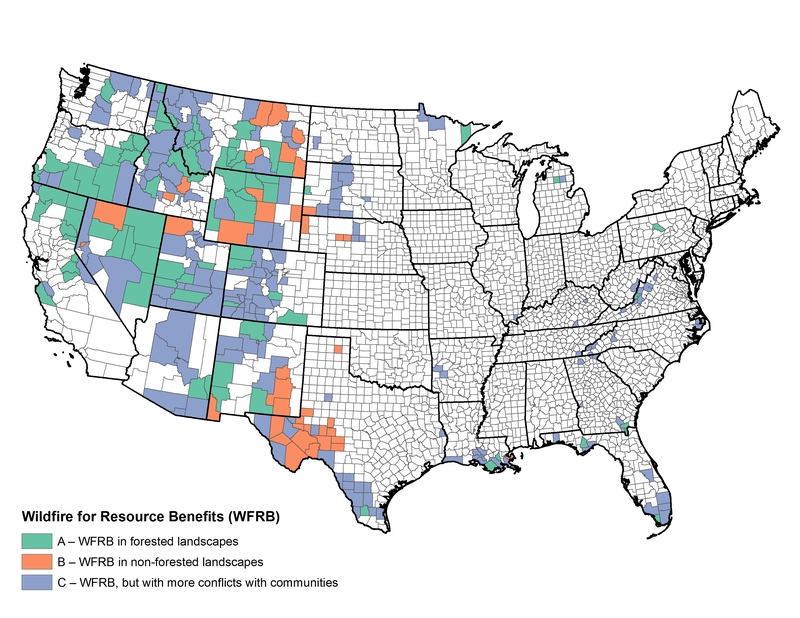 2.c: WFRB, but with more conflicts with communities. A third set of counties was highlighted where the landscape characteristics suggest potential ecological benefits from managing wildfire for resource objectives, but the community attributes suggest a higher potential for conflicts (Option 2.c, figure 3.4). Community concerns would necessarily lead to greater restrictions and control on incident management objectives. Conclusion: Managing wildfire for resource objectives and ecological purposes is a useful tool for managing fire-adapted ecosystems and achieving fire-resilient landscapes, but has limited potential for broad application throughout the Nation because of its inherent risk and statutory constraints.